Not a very exciting topic, and probably old news, but perhaps this approach to shower wall cleaning and maintenance will be of use to someone. Every morning while showering on the Discovery I’ve thought that I really need to do some preventative maintenance on the shower stall walls. I’ve been thinking that for two seasons now and finally decided to do something about it during some less than ideal weather a few days ago (at Eastbank). My thought was to wax the acrylic walls to make them less inclined to accumulate crud. We do squeegee and then dry the walls and glass after every use, but hard water (aka soap scum) was still building up. My plan was to use some regular liquid automotive wax to remove the scum and to slow its accumulation down the road. First though, those pesky original factory stickers were still on our shower walls and had to go. So after taking pictures for future reference (model/part info), I proceeded to remove the stickers. I scraped off as much of the paper labels as I could by hand and then used one of my favorite products – Citrasolve concentrate. 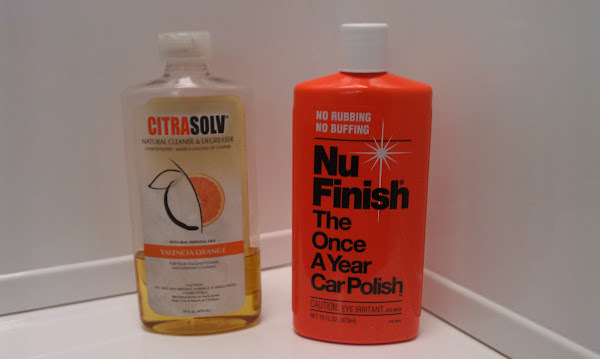 This is a citrus based degreaser product I’ve been using for decades to clean adhesive residue off all sorts of things. For example, inappropriately placed price or other tags on things you buy and boat bottom paint water lines where the masking tape has left a residue (from those days before painters tape was available). It is simply the best thing I have ever used for these type of jobs. The Citrasolve made short work of getting the label residue off the acrylic shower walls without a scratch. Then I started waxing the areas that had the heaviest layers of hard water build up using NuWax (orange bottle). This stuff is pretty good at cleaning and was doing the job, but it was a lot of work, requiring multiple passes and a lot of elbow grease. Then I noticed, where I had removed the labels with the Citrasolve, the hard water buildup was gone! Hmmm. So using the full strength Citrasolve concentrate on a paper towel I tried going over the whole shower – it was melting away the hard water deposits! I had to go over a few of the worst spots a second time, then wiped away the residue with a soft cloth. After that the waxing was a cinch! I waxed all the acrylic walls, seat and the edges of the shower pan up to the textured finish on the floor. I DID NOT wax the floor of the shower pan of course, but I did clean it with the Citrasolve – the floor was NOT slippery after wiping up the residue and rinsing with water. Now it’s easier to squeegee and wipe down the shower after use – in fact most of the water rolls off and not as much squeegeeing is needed. I figure if I re-wax every few weeks a major cleaning should not be needed for a long while. Another use I have found for Citrasolve is removing caulking residue, butyl tape – even silicone! It seems to attack the bond – I used a lot of it when replacing/re-caulking the windows on the Discovery – see this post. For me, it seemed to work even better than the commercial caulk remover now sold in home centers. I found that if you remove the majority of the caulk (razor, scraper or whatever) and then wipe on some Citrasolve and let it sit for a minute, the caulk remnants will then begin to loosen up and scraping with a fingernail or plastic scraper will take it off without scratching the underlying surfaces. For stronger bonding caulks like silicone you may need to repeat this process a couple of more times. This is the best system I have found so far for getting off all the old silicone residue – important because new silicone caulking will not adhere properly to old. When done, I then clean off the Citrasolve residue with denatured alcohol before re-calking. So CAUTION, when using Citrasolve to clean surfaces like shower stalls avoid getting it on the caulking! Will u clean my shower?? ?